The zombie subgenre has really taken off in the last ten years. Personally, I thought it would have died five years ago, but today it’s still running strong. The zombie is like the vampire. Both creatures are undead, and yet we love them. We love them so much that it might take another ten years before we finally get bored of them, if ever. Fifteen years ago, zombie literature was scarce. Today it’s everywhere. This brings me to Gerald Rice and his short gem of a novella, Fleshbags. The title of this book itself reeks of the undead, and what Gerald has managed to do with this story is not revolutionize the zombie market so much as help it evolve. His undead creatures are a different beast from your typical zombie, and it is really welcoming. What I liked most about Fleshbags, however, were the interesting characters that populate the story. Loman is on a mission to get to his daughter from school and save her from the sudden outbreak that makes people strip naked and their stomachs to look like translucent sacks filled rotting organ tissue. Along the way he teams up with a person who wears all leather and a motorcycle helmet, the latter of which he/she never takes off. Ms. Mila is a teacher at Loman’s daughter’s school who hates the children she teaches. Bill and his wife, Sarah, notice that Mr. Anders is home early from work, which he never is, and that there seems to be something wrong with him. When Bill goes over to investigate, he finds much more than a sick man. I once had a conversation with a friend about how zombies can be used for any metaphor the writer chooses, and Gerald Rice does a marvelous job of doing so in Fleshbags. The story, I thought at least, is about the dark things we store and lock away. Beneath the skin of every individual, there is something darker, perhaps even dangerous, lurking. There’s a secret behind every locked door you pass ignorantly by every day. Not only has Gerald created his own zombie, but he put them in a setting that was easy to believe, amongst humans, everyday people we all know, love and hate. My biggest criticism is that this is a novella with a large cast. It was difficult at first to remember who was who and what they were doing, but once I caught on, it was one hell of a ride. I also would have liked it if some of the subplots were smoothed out more. But don't let these things deter you from what is very much a fun read. 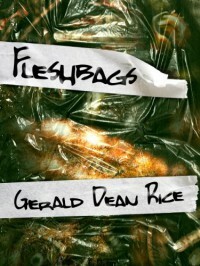 If you like zombies and the zombie subgenre, then I invite you to give Fleshbags a try. Do so, and you just might meet some interesting people.